The boiler is the workhorse of any batch still, and it needs to be rugged because it takes the most abuse of any other component. It is sometimes subjected to open flame, corrosive beer, and heavy charges. For those reasons selection of the materials and capacity for this component is very important. Various sources have suggested that a good boiler can be constructed by converting used restaurant pots, stainless steel wash pails, bakers dough pans, used soda and beer kegs, old swimming pool filters and a few other such things into a boiler. These items are all good candidates for the purpose, but converting them into a boiler for a reflux column is not always easy. Sometimes these vessels require considerable modification and specialized welding in order to provide proper connections to the column and a way to disassemble the apparatus for cleaning. You should always give considerable thought to what fabrication will be required before you make your selection of boilers. It is very important that you be able to easily separate the boiler and column sections for cleaning. Also, construction is made a lot easier if the boiling vessel has a tightly fitting, removable top, but you must insure that any rubber or plastic gaskets will not impart an off taste to the spirits when subjected to the boiling vapors. You also need to make sure that you have enough room in the vessel to hold the batches you intend to distill, that it is sufficiently durable to withstand the boiling and charging processes, and that it will not taint the distillate with any objectionable metallic flavors or impurities. Stainless steel is an ideal material for use in a still boiler because it cleans easily, looks nice, and has great resistance to the effects of boiling corrosive liquids. And while this material is difficult for most handymen to work with, it's possible to use ready made stainless utensils that may be adapted for this purpose. Some time ago, when building the first still for this site, the vessel that I found most suitable for this purpose was a used stainless steel milk can. At that time they were commonly available in most rural dairy farming regions of the U.S.A. The nice thing about them, other than availability, was that the flat top made it easy to attach the column. They hold about 10 U.S. gallons, have a removable top, and were easy to move about because of the nice handles. They are also nice to look at. You can actually grow to love the art in this vessel. 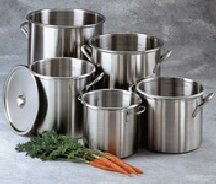 However times have changed since then, and now because of the diminishing availability of these stainless steel milk containers, and their increasing cost, you might want to consider other alternatives. Nevertheless, they make a fine boiler. Their biggest advantage for this purpose is the removable, water tight cover. This allows the boiler to be easily charged, and easily cleaned. Perhaps more importantly, the flat cover top makes it quite easy to attach the reflux column to it using either TIG welding, Silver or Brass brazing, or with a bolt-on flange. If you'd like to consider using this type of boiler, Appendix 2 contains a list of sources within the U.S.A. that currently deal in these containers. Stainless steel beer kegs also provide an excellent alternative to the milk can discussed above, and are much more available. The major drawback is that, without modification, they cannot easily be cleaned, charged, or inspected internally. Another issue is the capacities that they are manufactured in. Beer kegs are commonly available in the U.S. in half keg (15.5 gallon) and quarter keg (8.25 gallons) capacities. For home distillation, the most practical batches consist of about 25 liters ( 6.6 US gallons) of wash. The fermentation vessels and prepared packages of yeast for these size batches are readily available at most brew shops. And while both keg sizes will suffice for the task, there are a number of advantages in using the half keg size. The first is a matter of stability. The stills described in this manual contain columns that stand almost three feet over the top of the boiler. That allows them to be easily tipped over when a small base is used. Also the quarter keg size is made with an egg shell shape. This also makes the base even less stable. Secondly, the quarter keg has a smaller diameter, and less free space over the liquid when filled with a 25 liter charge. Both the small diameter and free space above the liquid surface can cause instabilities in the vapor flow up the column during operation. Also, the quarter keg size has no convenient handle grips with which the keg can be easily moved about. Finally, the half keg size has built in handles in the rim and allows a double batch to be processed in a single run. In some circles this is considered an overwhelming advantage, particularly when a single batch of beer weighs almost 50 pounds. In any event, it's up to you to decide what's the best boiler for your particular needs. The two discussed above are only meant to give some guidelines.